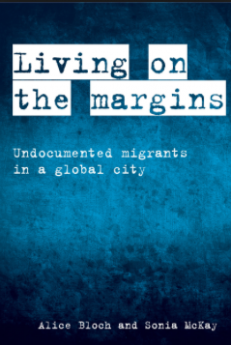 "The book offers interesting insight into the everyday life of undocumented migrants without portraying them as helpless victims. Ample quotations from the interviews underline their agency and the complex and contradictory conditions they experience in the ethnic enclaves they are forced to rely on. Bloch and McKay shed light on the circumstances, motivations, and conditions of ethnic enclave employers, who, in most of the literature on undocumented migration, are not a subject of research. This approach helps overcome simplistic accounts that portray those employers merely as ruthless exploiters who take advantage of the undocumented, as it brings to light a wide range of motives and contradictions they face themselves, while it does not deny that the undocumented are usually underpaid, work overtime in precarious conditions, and have practically no labor rights. (…) The book’s clear structure and the vivid firsthand testimonies make Living on the Margins accessible for undergraduate and graduate students. It is a valuable resource for a wide range of courses in labor and migration sociology, inequality, citizen rights, law, and ethnic and cultural studies."